Belgian Bowl Waffle Maker Just $22.18! Down From $46! You are here: Home / Great Deals / Amazon Deals / Belgian Bowl Waffle Maker Just $22.18! Down From $46! Hurry over to Amazon to score this Belgian Bowl Waffle Maker for just $22.18 down from $45.99 PLUS FREE shipping with Amazon Prime or for orders over $25! 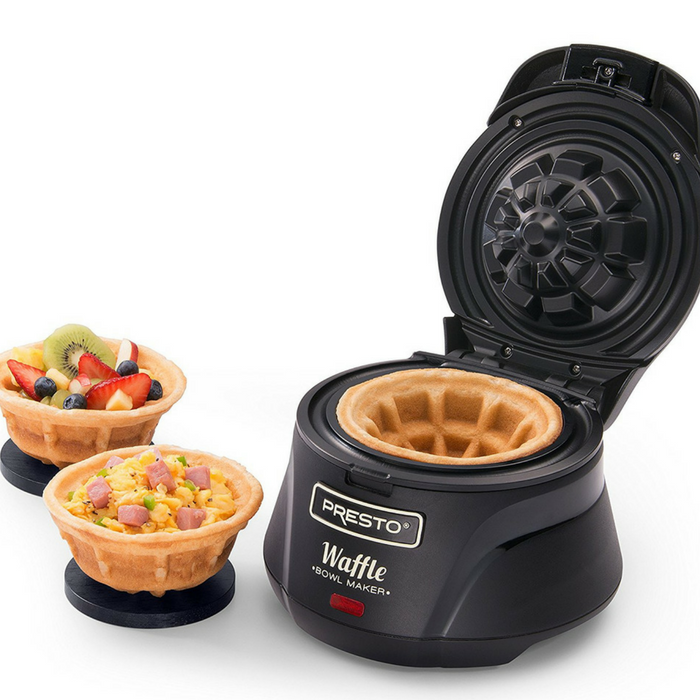 The Presto Belgian Waffle Bowl Maker is a delightfully different kind of waffle bowl. It makes a 4-inch waffle that’s thick, fluffy and tender because it’s a real waffle! Fill it with your favorite toppers: butter and syrup or fresh fruit and yogurt. Make hearty breakfasts by filling it with scrambled eggs, ham, sausage, hash browns and more. No special batter is needed. Use store-bought waffle mixes or homemade. Recipes for traditional waffles and more are included. Make breakfast exciting, dessert extraordinary and take lunch to a new level with chicken waffle tacos. There’s endless filling possibilities!